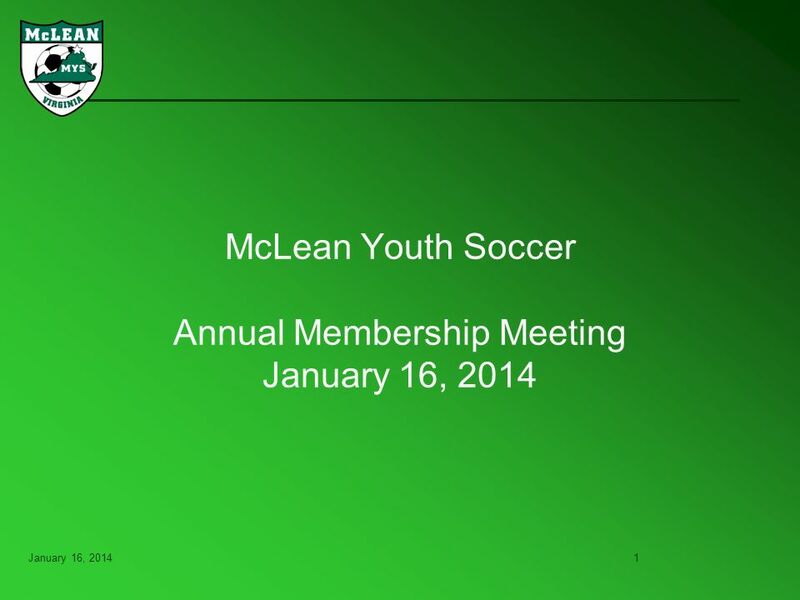 January 16, 20141 McLean Youth Soccer Annual Membership Meeting January 16, 2014. 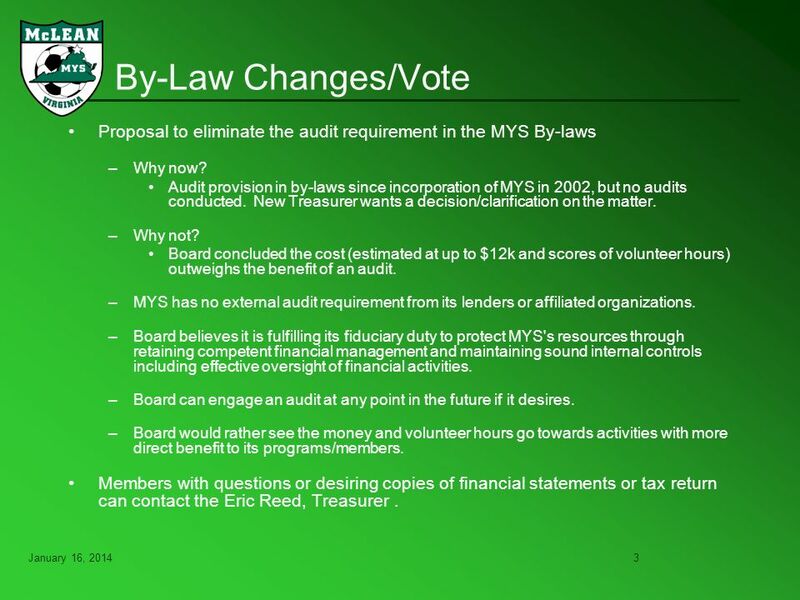 3 January 16, 20143 By-Law Changes/Vote Proposal to eliminate the audit requirement in the MYS By-laws –Why now? Audit provision in by-laws since incorporation of MYS in 2002, but no audits conducted. New Treasurer wants a decision/clarification on the matter. –Why not? Board concluded the cost (estimated at up to $12k and scores of volunteer hours) outweighs the benefit of an audit. 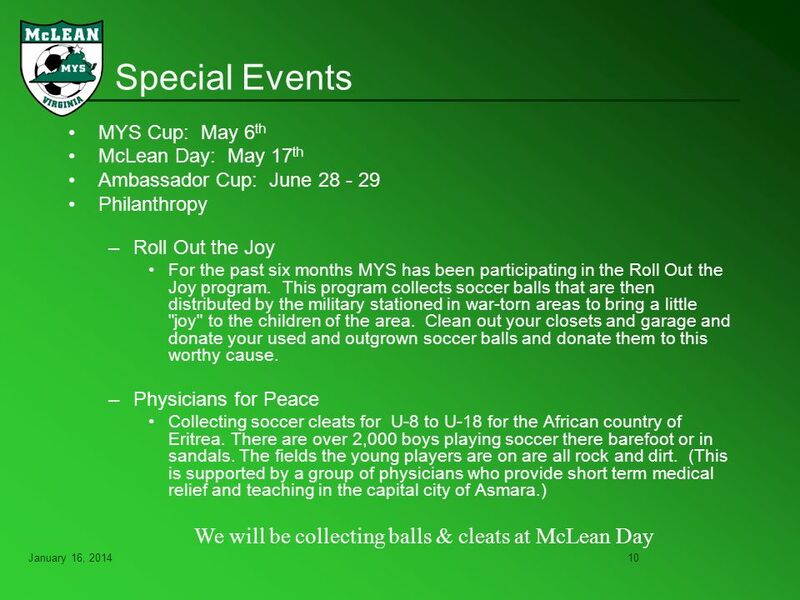 –MYS has no external audit requirement from its lenders or affiliated organizations. –Board believes it is fulfilling its fiduciary duty to protect MYS's resources through retaining competent financial management and maintaining sound internal controls including effective oversight of financial activities. –Board can engage an audit at any point in the future if it desires. –Board would rather see the money and volunteer hours go towards activities with more direct benefit to its programs/members. Members with questions or desiring copies of financial statements or tax return can contact the Eric Reed, Treasurer. 4 January 16, 20144 By-Law Changes/Vote Article IV –Sec. 1 (a). Change to 2 year staggered terms is aimed at avoiding turnover in too many key positions at one time. –Sec. 1 (b). This keeps the appointed positions at one year terms to give a new Chairman maximum flexibility. –Sec. 1 (c). The current process for replacing an appointed board member lacks clarity. The unanimous waiving of the one meeting notice provides for quicker board response to a vacancy. –Sec. 4. Changes the 5 year term limit to 6 since terms would be 2 years long. Provides for extending the term of an officer past the term limit through board approval by a two thirds majority in a secret ballot to allow the club to retain the services of an individual when a large majority believes it advantageous. –Sec. 5. 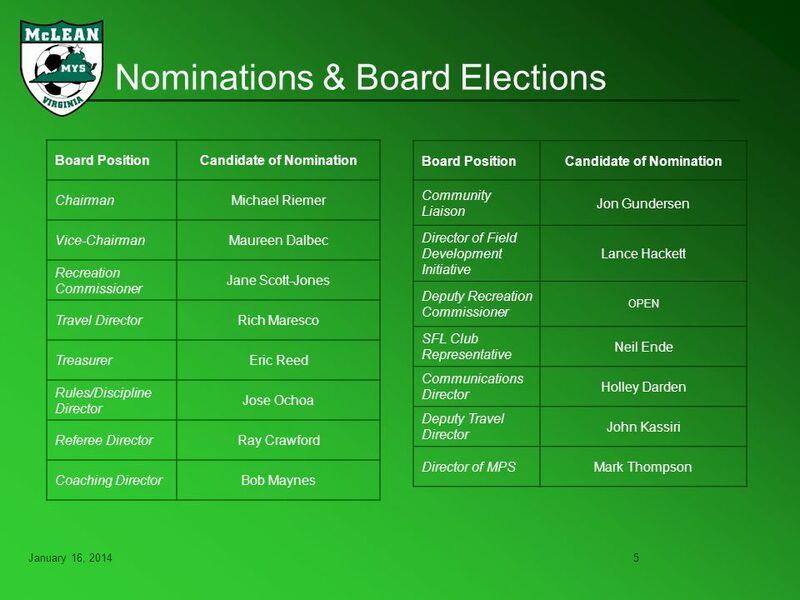 Provides for broader participation in determining the slate of nominees presented to the membership. –Sec. 6. Change necessitated by change to 2 year terms. –Sec. 7. As in Sec. 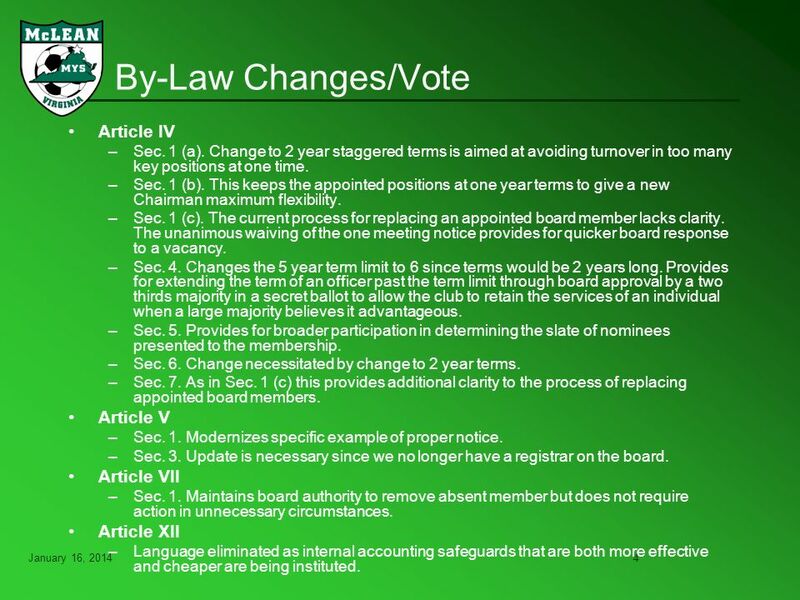 1 (c) this provides additional clarity to the process of replacing appointed board members. Article V –Sec. 1. 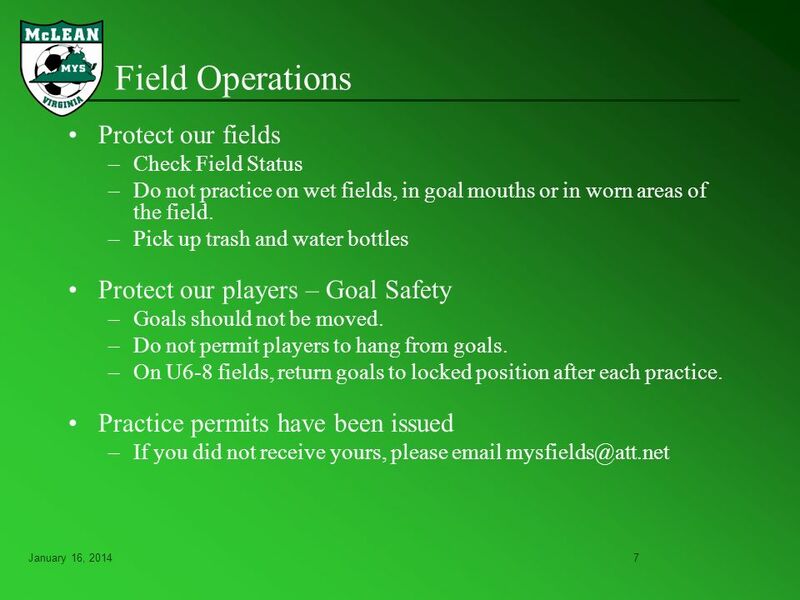 Modernizes specific example of proper notice. –Sec. 3. 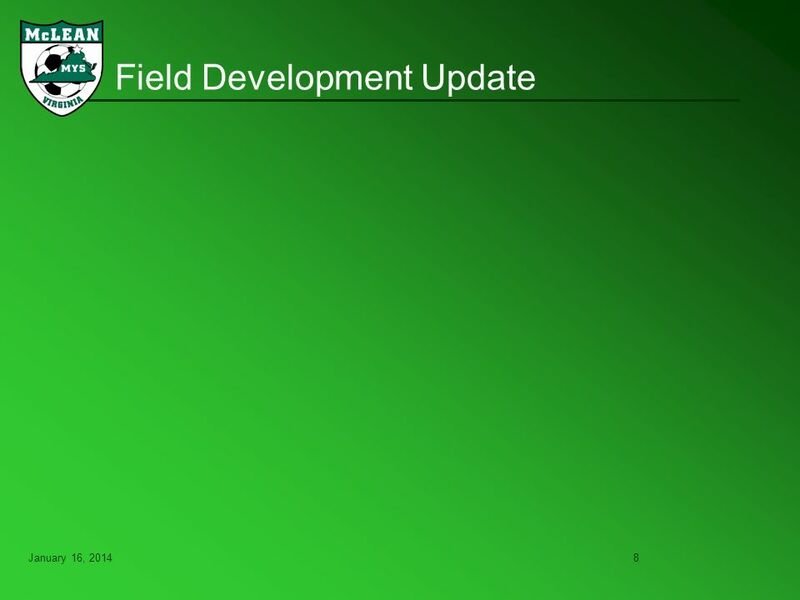 Update is necessary since we no longer have a registrar on the board. Article VII –Sec. 1. Maintains board authority to remove absent member but does not require action in unnecessary circumstances. Article XII –Language eliminated as internal accounting safeguards that are both more effective and cheaper are being instituted. 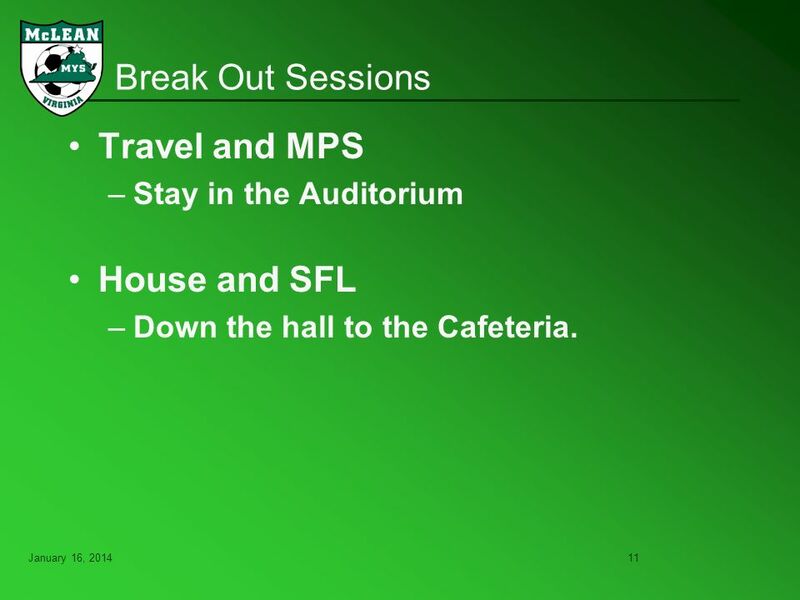 11 January 16, 201411 Break Out Sessions Travel and MPS –Stay in the Auditorium House and SFL –Down the hall to the Cafeteria. 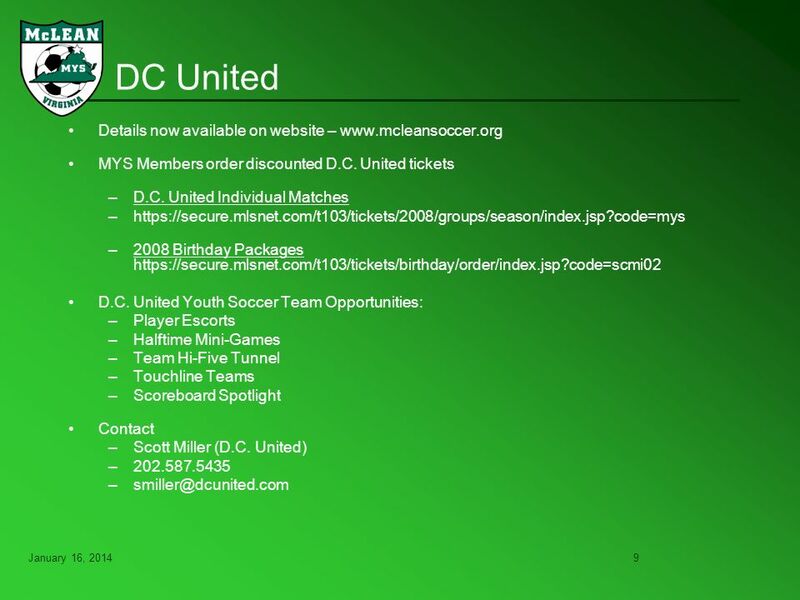 Download ppt "January 16, 20141 McLean Youth Soccer Annual Membership Meeting January 16, 2014." 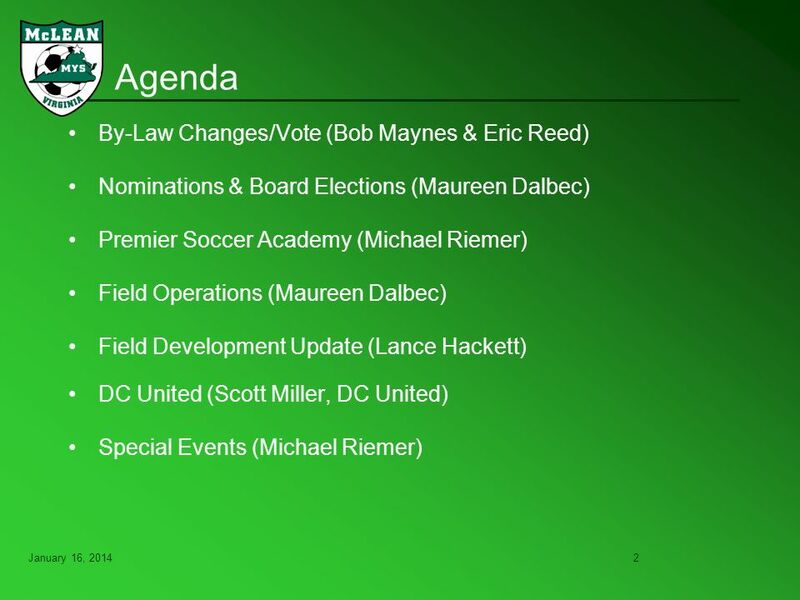 2012 PRESIDENT’S PRESENTATION COMMON MISCONCEPTIONS LEAGUE REQUIREMENTS LITTLE LEAGUE FORMS ELECTION PROCESS MISCELLANEOUS. BY-LAWS COMMITTEE PRESENTATION MARCH 2007 PRESIDENTS CONFERENCE. Constitution & Bylaws Amendments for Chapter Ratification. Parent Information Meeting 2015 Season CREEK FLASH BASEBALL. MSA ACADEMY. 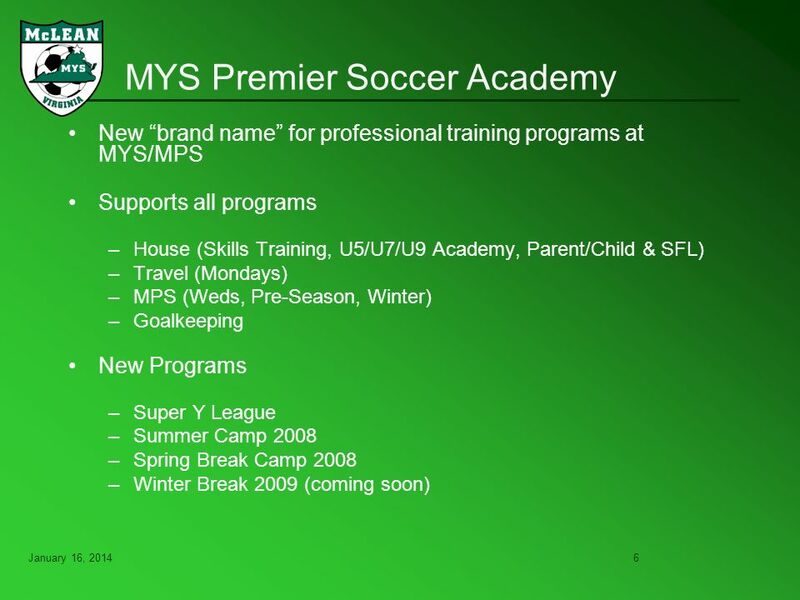 Why MSA Academy? Fun! No Travel Lower Cost Great Value!! More Playing Time Bridges gap to travel Keeps kids playing together Increases player. FALL 2011 DC Stoddert Soccer Recreational Program. WELCOME Lima Senior Athletic Department Spring 2015 Pre Season meeting.